An easy dinner recipe that your family is going to love. 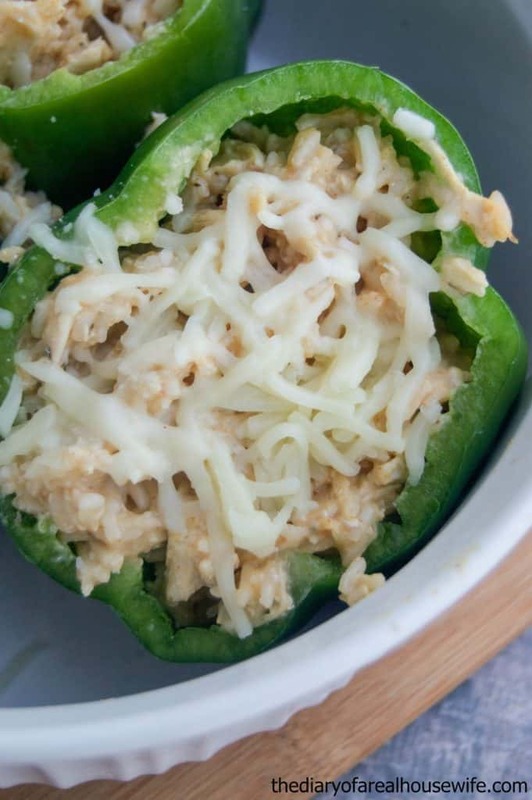 These simple Chicken and Rice Stuffed Peppers are filled with my favorite chicken and rice recipe then baked and topped with mozzarella cheese. Hi there, it’s Jennie from The Diary of a Real Housewife stopping by with another easy recipe. Chicken and rice is one of my favorite comfort foods. My mom it all the time, like all the time. Yet I never got sick of it. It was a cheap meal that could be made in a hurry, my kind of easy recipe! My mom would always make hers in the slow cooker and it was served a lot on Sundays after church. 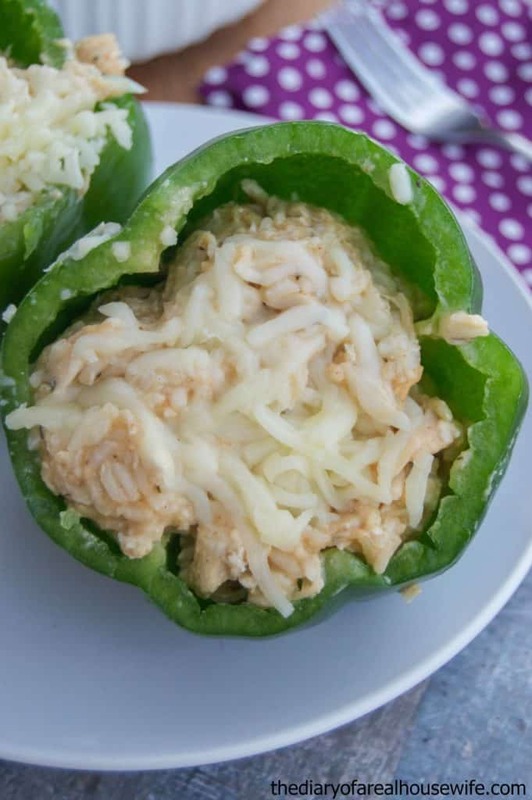 I’ve made chicken and rice several times for my family but this time we did it just a little differently with these Chicken and Rice Stuffed Peppers. I’m not going to lie to you, while my kids love chicken and rice they didn’t really like the idea of it being cooked in a pepper. Instead I served them the chicken and rice with slices of fresh bell pepper. My kids like to have their food separated, are yours like that? For my and my hubby thought I took the chicken and rice and filled the bell peppers then baked them. Right before they where done I added mozzarella cheese to the top to bake an extra few minutes. It’s simple to make and something new that hopefully everyone in your family will enjoy. Even if it has to be plated separately =) If you love this recipe make sure to stop by and check out my newest E-cookbook, Family Friendly Dinner Recipes! With a month full of recipes. The best part, the menu plan and grocery list is already made for you. You can also stop by and check out some of my other super easy meal ideas like few of my favorites, Taco Mac Casserole, Slow Cooker Chicken Noodles Soup, or a fun dessert like my easy Hot Chocolate Dip. 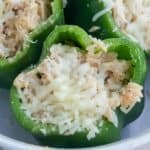 These simple Chicken and Rice Stuffed Peppers are filled with my favorite chicken and rice recipe then baked and topped with mozzarella cheese. If you have not already you want to start with cooking your rice and chicken. Make sure both are fully cooked and then set aside (This would be the perfect recipe for leftover chicken or rotisserie chicken). Preheat oven to 350 degrees F.
For your cream sauce add butter to a saucepan and cook on medium until melted. Add garlic and allow to cook for another minute. Whisk in flour until well combined. Add broth and whisk together until well combined. Add salt, pepper, and thyme to your cream sauce. Allow to cook for 3-5 minutes. Add cooked rice with cooked and shredded chicken to your sauce pan with the sauce. Mix until well combined. Slice the top of your peppers and clean out the sides. Place them in a casserole dish. Spoon in chicken and rice into your green peppers. Bake for 40-50 minutes. 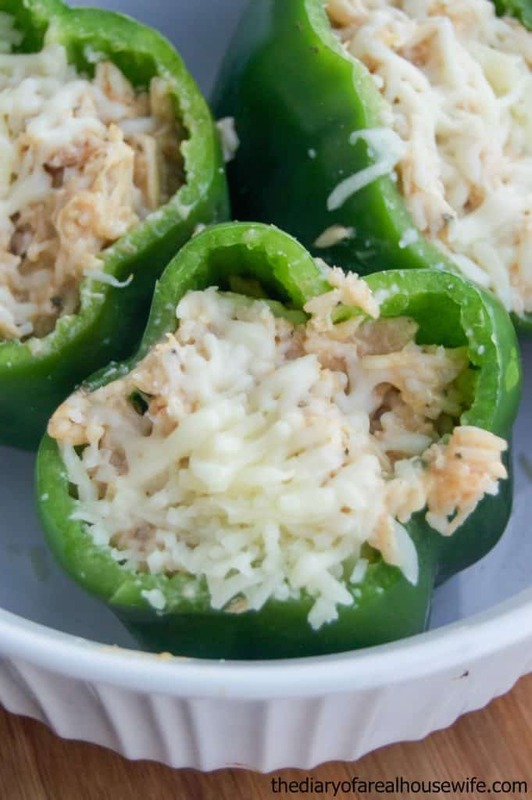 Remove from oven and top with shredded mozzarella cheese then place back in the oven for 10 more minutes.